Inshore- We were blessed with some gorgeous weather this week and that has really brought us some clear clean waters around Johns Pass lately. Also, the white bait is large enough to net and has been fairly prolific around the pass lately too. Plus, we finally got our fiddler crabs back in stock and the sheepshead bite has been great on the fiddlers. I love to use a 2ot hook with 20lb floro and I hook the fiddler crab underneath the shell up through the top of the shell putting the barb of the hook at the base of the 2nd to the last leg with the last leg being his back leg on either side of the crab. We are seeing lots of trout caught at night around the lights of johns pass especially using live shrimp or the DOA shrimp worked super slowly. Also at night, we have seen a good bite of snook recently around Johns Pass. This past week, Joe Piervincenti, from Tampa caught a snook at night around the docks using a small Spro jig on the start of the outgoing tide and he commented that plenty of other Johns Pass anglers were landing snook at night as well. The silver trout and whiting have been biting well from the jetty of Johns Pass using live shrimp weighted to the bottom. Storm Blackman, from Holland, caught a nice whiting using this approach this past week. Near shore- Gag grouper closed up with a bang, we had a great catch of gags the last few days of the season but they did seem to slow down a bit near shore towards the end of season. Now that gags are closed we will be targeting more of the red grouper, hogfish, mangrove snapper, lane snapper, and others near shore. 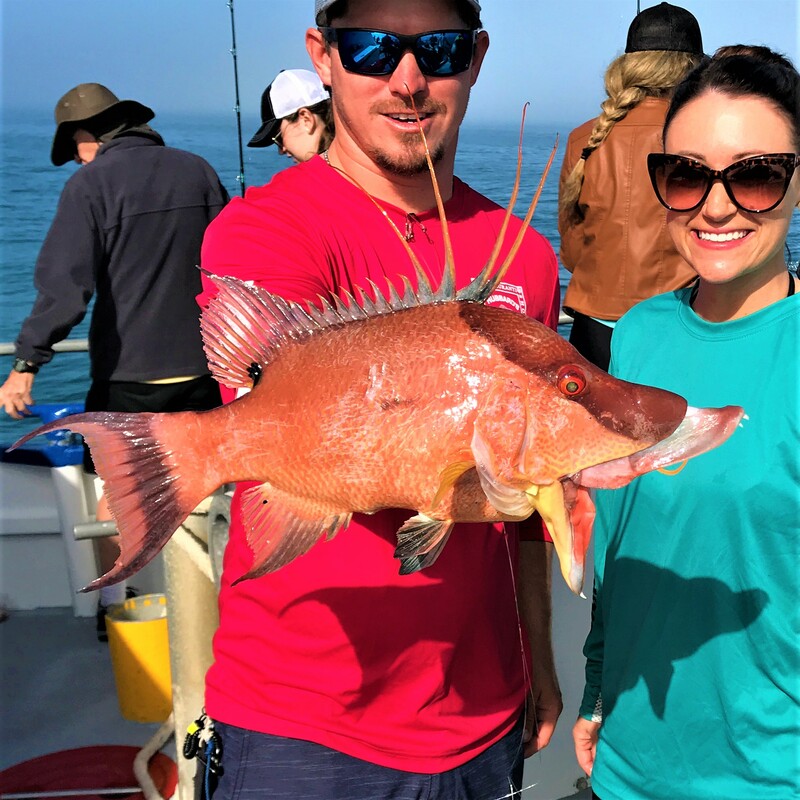 The hogfish bite is definitely picking up for us as the waters continue to stay cool and clear up. The hogfish love the fiddler crabs or live shrimp on a knocker rig, jig head or a jig like the Captain Chappy’s hogballs. We expect the hogfish action to stay consistent through the spring of 2019, we still get them when the water warms in the summer but the best time for hogs is definitely around December through April. Red grouper bite is a little picky right now, but now that gags are closed we will focus on them more often and figure out the best depth for them. We did get a handful of keeper red grouper around the 70-90 foot areas at the beginning of this week. 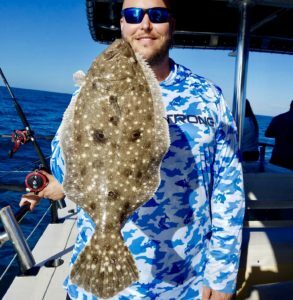 Also near shore we have seen a huge push of some monster flounder and mangrove snapper which is very unique and has been a pleasure to see. We typically have mangrove snapper near shore but right now we’re seeing 39 hour quality mangroves around the near shore waters biting on small pinfish. The big flounder have been a nice bonus along with the mangrove snapper caught on live shrimp or small pinfish on the sandy bottom adjacent to any structure that hold bait like the near shore ledges, rock piles or wrecks. 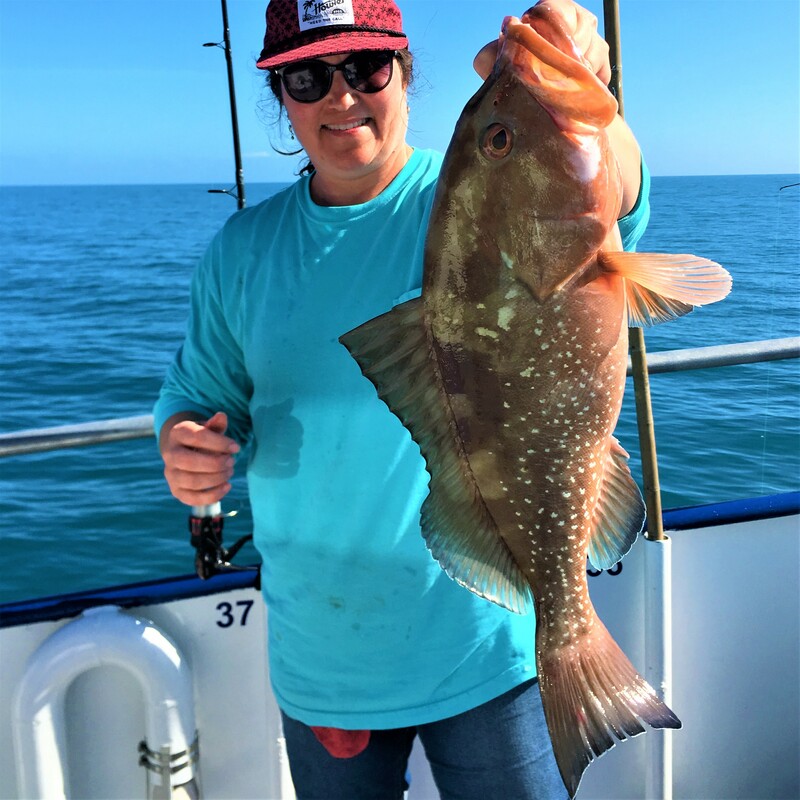 Offshore – The end of gag grouper season was stellar weather and even better gag grouper fishing, we had a Flying HUB 1 private charter the last day of gag grouper season that fished nearly 100 miles from Johns Pass catching multiple 30lb or larger gag grouper. Now that the gags closed we are doing deep drop fishing aboard the Flying HUB 1 fifteen hour charters. Our 12 hour extreme, 39 hour overnight trip and the 44 hour full moon trips will be targeting red grouper, scamp grouper, mangrove snapper, yellowtail snapper, vermillion snapper, porgies, a few mutton snapper, tuna and whatever else will cooperate for us. On our recent long range overnight trip our first mate, Will McClure pulled up nearly a 50lb cubera snapper and this weekend’s 39 hour is going back to try to get a bigger cubera snapper. Plus, the January and February time frame is a killer time of year to get offshore and target blackfin tuna especially around the new and full moons! We have super light loads on our long range overnight fishing trips in January and it’s a great time to get out there and target the blackfin tuna, mangrove snapper, scamp grouper, red grouper, yellowtail and many more great eating fish with hardly anyone else on board! We have two more 39 hours and a 44 hour left in the month of January if you want to book a long range adventure with us at Hubbard’s Marina to kick start yoru new year with plenty of fresh fish. Friday January 18th is our first 44 hour full moon fishing trip of 2019 and we have a super stupid light load on that trip right now and it should be a great opportunity for tons of the great eating snapper, killer chance at plenty of blackfin tuna on the full moon night bite, and we will target the red and scamp grouper through the day time. We have a Tuesday 39 hour on January 22nd and a Friday 39 hour coming up January 25th. The Tuesday trip will have the lightest load for sure, but the Friday trip is looking like another light load too. These 39 hours will be a great opportunity for the same catch the 44 hour offers just a little less fishing time at night compared to the 44 hour full moon trip. NEW MOTORS GOING ON THE FLYING HUB 2 this week at Hubbard’s Marina we have gotten rid of our mercury engines that didn’t work too well for us and we are going to the biggest Suzuki outboard engines on the market with the dual props. This should provide us more low end torque to jump the boat onto it’s under water wings to fly offshore even more quickly, efficiently and fast! Book your 12 hour extreme trip in January now for an opportunity to ride the first ever USCG inspected hydrofoil assisted catamaran in the gulf of Mexico. 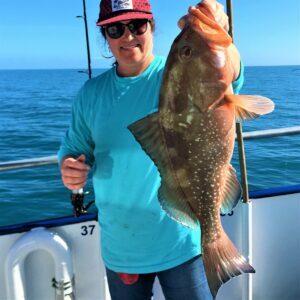 This boat is totally unlike anything you have fished from and the extreme trip should be a great chance to get plenty of great eating snapper like the big mangroves and yellowtails plus a shot at some red grouper, scamp grouper and blackfin tuna as well! Want some FREE fishing trips with us at Hubbard’s Marina? Want to learn more about near shore and offshore fishing? 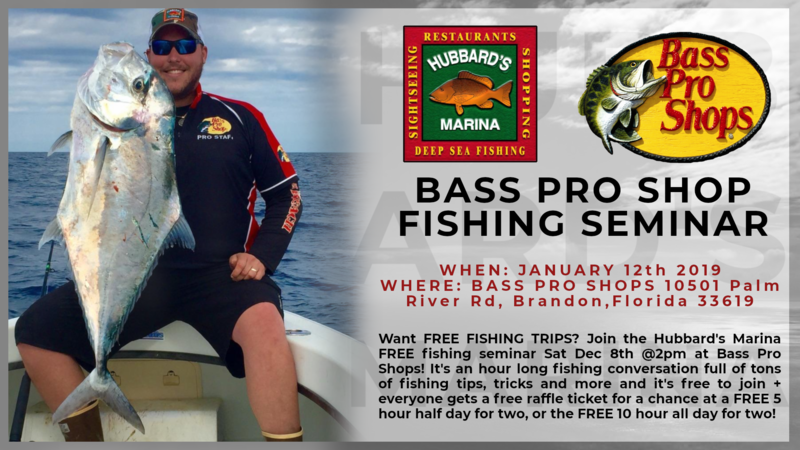 Check out the upcoming Bass pro shops fishing seminar with Capt Dylan Hubbard at the Tampa bass pro location. The next seminar will be Saturday January 12th at 2pm. The fishing seminar or fishing conversation will be about an hour long of fishing conversation, tips, tricks and more! Plus, at the end of each seminar Capt Dylan gives away a FREE 10 hour all day for two guests and a FREE 5 hour half day for two guests to two lucky winners of the FREE raffle. To be entered in the raffle you just have to show up around 2pm and stay for the hour seminar. 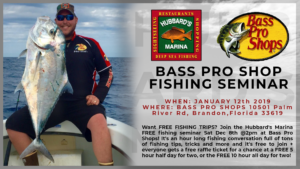 Check out the Facebook event for this upcoming seminar here – https://hubbardsmarina.com/bass-pro-fishing-seminars/ You can also view all the past bass pro shops seminars at this page too! Red tide is completely gone in the state of Florida, all reading levels are below ‘background’ ratings! This is great news, now hopefully they tell the national news about it too! Red tide is completely gone from the state of Florida finally! Great time to get out on the water and see the local wildlife, especially around the bird nesting islands, Egmont key or on our dolphin cruise at Hubbard’s Marina! Right now the water is a bit chilly to snorkel out at Egmont key island, but the weather is perfect for exploring the island’s walking paths and hiking trails and the big fort that sits on the island’s interior. Plus, this time of year the weather makes the island nearly bug free compared to the summer time when the mosquitoes can get a little thicker out there. The Shell key ferry trip is not running or offered this time of year due to the low amount of interest in the area. However, it will resume this spring starting in march with daily rides out to shell key island multiple times per day! For now, the only option is a day out at Egmont key with the Tampa Bay Ferry by Hubbard’s Marina.